As the service that I provide is a very personal one, I think it is important that I tell you something of my history and background, so that you will begin to see how my knowledge and skills have culminated in the services that I can provide for you as The Dog Whisperer. There is a very strong empathy with (all) animals within me, this not only took time to develop but, also, to find the right channel. Initially I believed that to go farming would provide me with the outdoor environment, contact with animals and the way of life that I needed. I was accepted at The Royal Agricultural College, Cirencester. Although I had lived in the country, I obviously had to gain real practical knowledge for my 2 year course. I think that the farm workers, who witnessed my first attempts to milk a cow must have thought I had landed from another planet - nor were there any green designer wellies to wear in those days! Whilst at Cirencester, I started to learn to ride horses but not on your conventional riding school hack but on a friend's fit point to point horses. A lofty start in every sense but I had no fear, learnt quickly and developed a real empathy with the horses. By the time I left Cirencester, I had, already decided that farming was out of my reach, not least because of the capital required but I, also, realised that I did not possess the necessary feel of the soil that so many of my (farmers' sons) contemporary's possessed. 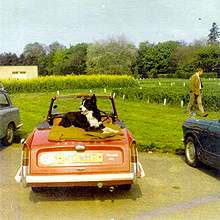 "Rover" My constant companion at college. My first hand experience of a rescue dog. 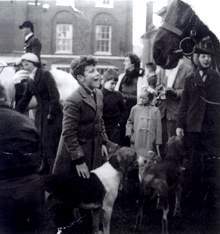 I then started my next major career change...... became a working pupil at a riding school in The New Forest - qualified as a riding instructor with The British Horse Society and then worked for Jenny Loriston-Clarke and was privileged to look after her famous stallion Dutch Courage. I left Jenny's in order to manage 3 private training and breeding yards in the UK - then I was offered the unique opportunity to go to Bahrain as the Stud ad Stable Manager to His Highness, The Amir of Bahrain - after I had found where Bahrain was situated, it did not take me very long to accept the post! I spent 4 tremendous years in the Gulf - wonderful experiences and probably most of all it developed another latent part of my character, namely the ability to plan and co-ordinate major events. 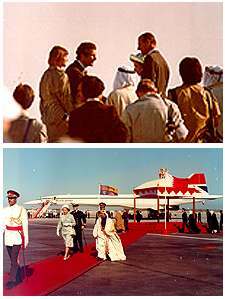 As well as the weekly race meetings for His Highness, I planned a race meeting in 1979, which was attended by Her Majesty The Queen, organised the first sponsored show jumping events in Bahrain. I went in and out of (pre-revolution) Iran to purchase feed for the 500 horses that I was responsible for. Anyone who spent time in the Gulf in the 70/80's will understand my feelings and memories of the wonderful ex-patriate life style, friendships and non-stop parties (but the latter is another story!) that we all enjoyed. I extracted myself from Bahrain, after the Iran v Iraq war had started, especially as His Highness had more pressing problems - I took myself off to Kentucky, USA and worked on one of the top stud farms there for a year. With the intention to return to the UK to set up a training yard with my long term friend, Paul Fielder. But our objective was not to be realised as we were unable to find the right priced property with all the necessary riding and training facilities in the desired location in the south of England. Having been abroad for over 5 years, I realised that I needed a career with some prospects, especially if I could not be my own master having had such unique opportunities in both Bahrain and Kentucky. The Guide Dogs for the Blind Association was recruiting at the time for trainee instructors - so I started again at the bottom! - cleaning out the kennels and living in at one of their regional centres. 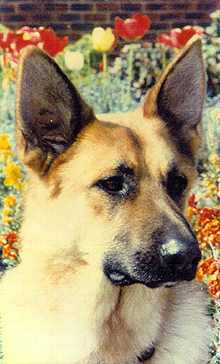 I progressed through the various levels until I qualified as a Guide Dog Mobility Instructor. "It is these skills that enable me to work so well as The Dog Whisperer. The ability to train the wide range of dogs in a quiet and gentle manner with the authority, personality and confidence to ensure that my clients not only understand the problems but work through these areas with their dogs and become 'a working unit'". 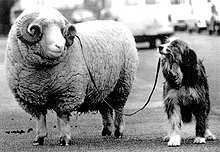 "Ewe too can be trained"